How to create a Virtual Pageview. In the first example, the parentheses contains a pseudo page name i.e. 'my first virtual page view' and in the second example the parentheses contains a pseudo directory structure. Your website has a complex URL structure due to dynamically generated web pages. You want to track file downloads. You want to track outbound links. If you have a website that dynamically generates pages based on certain query parameters then you can use virtual pageviews to help clean up your Content Report. Virtual pageviews will help make your reports easier to read and understand. For example, if your original link looks like the following example, then it will be difficult to interpret the same in your Google Analytics reports. By doing so you will generate a virtual pageview with a meaningful name, and thus you can categorize all such dynamic pages into groups within your contentreport. Google Analytics by default cannot track any file downloads by using standard GATC implementations, since a file download will not trigger a new pageview. Thus, you will need to create a virtual pageview to trick the system to generate a pseudo pageview when someone downloads a file from your website. By doing so, you will generate a virtual pageview when someone clicks on the download link. Virtual pageviews are captured in the Top Content and Content Drill Down reports. Google Analytics by default cannot track your outbound links. However, you can leverage virtual pageviews to track any outbound links which you may have on your website. By doing so, you will generate a virtual pageview when someone clicks on this outbound link. The virtual directory structure will provide context for your report analysis. 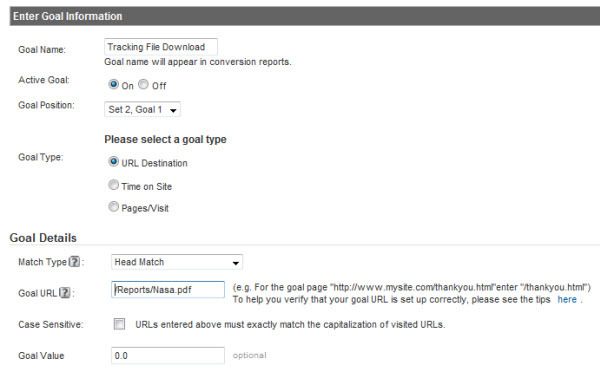 You would like to track a pdf file download as a goal in Google Analytics. Accomplish this task using virtual pageviews. 2. Within an appropriate profile create a new Goal. 3. Use the following configuration for your new Goal. Note that the Goal URL in the following screen shot matches the virtual pageview that you created in step 1.